This is another one of those days where my brain has nothing. Which may or may not have to do with the fact that Easter was yesterday (Eastern Orthodox usually celebrates on a different day, we make sure passover is over before we celebrate. It's a pain though when the rest of the world celebrates a month prior - all the Easter candy is stale by then) and we hosted a huge dinner party. Lamb on a spit, more desserts than I can count, and two armfuls of wine bottles. Okay, two of those were ouzo. If you don't like black licorice, avoid that. Oh well, I get first dibs on the leftovers. For you guys, I'll just leave you with a picture of the wonderful product that saves me during Lent on no dairy days. I think I'm odd because I don't love Nutella, probably cause I feel like it should taste more like chocolate since it looks like chocolate. 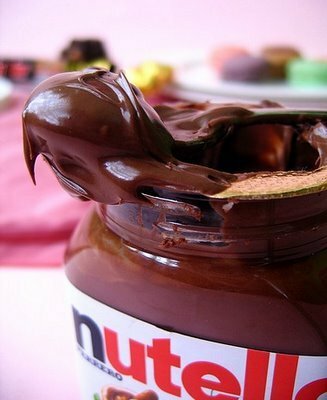 I like Nutella, I just don't love it. I haven't had Nutella for years. Hmmm, where's my shopping list? We used to eat Nutella with vanilla ice cream, yum yum. I've got a bit of a craving now! Life just wasn't the same before Nutella. Sounds like a nice Easter. I knew Eastern Orthodox usually celebrated later, but I never knew why. So, thank you! Oh my gosh!!! Nutella!!! LOVE that stuff!